This comprehensive Georgia tour covers all major highlights and sites you need to see in the country as a traveler. Apart from having a tour around Georgian capital city Tbilisi, you will have 2 full days in the Kakheti region, known as a wine area of the country – you will learn all about Georgian traditional winemaking method, as well as have wine tasting events. 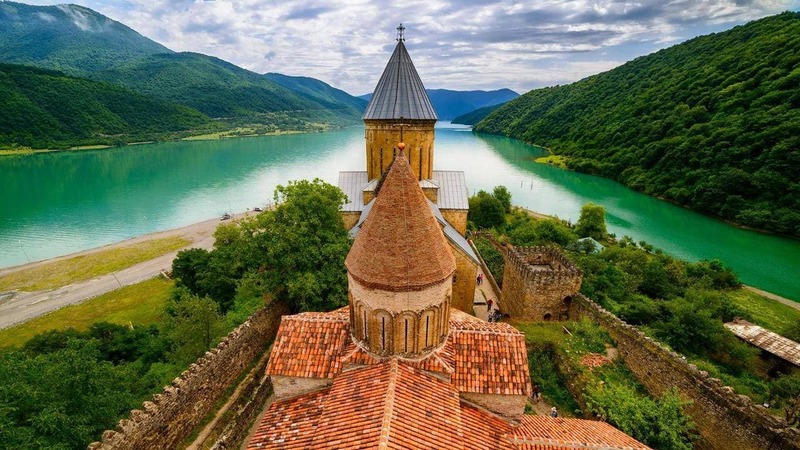 Another two days will be spent traveling to Kazbegi (Stepantsminda) and its major highlight, Gergeti Trinity Church, centuries old cave town of Uplistsikhe, and of course Georgian ancient capital – Mtskheta. This private Georgia tour program also incorporates one free day in Tbilisi, so you can spend a day in the city the way you want. Detailed tour itinerary is listed below. After breakfast at your hotel embark for a 2-day trip to Eastern region of Georgia – Kakheti. The heart of Alazani valley famous for its ancient winemaking traditions. Numerous vineyards as well as both big and small wine producing facilities are biggest landmarks of the region. In about two hours of journey following beautiful rural road and picturesque mountain Gombori Pass you will arrive in Telavi – historical and administrative center of the region. This small town is the best place for visiting local farmer market. Next stop will be the Alaverdi monastery, the 6th century Orthodox monastery that is still in service. Continue to one of the highlights of the day – private winery in Napareuli village. A vineyard, winery, and wine cellar located in arguably the most beautiful place in the region – the footsteps of Greater Caucasus mountain range. This family-run winery produces four types of traditional Georgian wine on 11 hectares of their own vineyards: Saperavi, Kisi, Mtsvane and Rkatsiteli. You will have a detailed wine tour, followed by delicious lunch and wine tasting. Your next destination this day will be the “Hyde park on Alazani” – picturesque garden inside the Chavchavadze house-museum in the village of Tsinandali. Museum tour and delicious wine tasting will add up to the whole atmosphere. Return to Telavi for overnight. Second day of the trip to Kakheti will start with a journey to Gremi architectural complex – 16th century Royal citadel of Kakhetian kings. The ambience of the place, right after you pass its threshold, still retains the Middle Age aura. Visit the “Winery Khareba”, one of the biggest wine producing company in Georgia, and its unique wine cellar, which is located inside the tunnel excavated deep into the mountain gorge – total length of the wine tunnel lanes is 7.7 km long. The location gave a name to the wine cellar – “Gvirabi” (tunnel). Have a tour of the premises and wine tasting of four types of beverage made by both local Georgian, and traditional European methods of winemaking. Drive to the town of Sighnaghi, also known as a “city of love” (mostly for the fact that one can register a marriage there 24/7). Previously a royal residence, this small Kakhetian town is surrounded by an ancient city walls with watchtowers. Return from Kakheti to Tbilisi (about 2 hours drive). Check-in to hotel, and overnight. ​After breakfast in the hotel start driving back towards Tbilisi with the stops in Uplistsikhe and Mtskheta on the way. From Gudauri in about 2-hour drive the group will arrive to the cave town Uplistsikhe – the magnificent remains of an ancient pagan settlement where all the houses used to be carved inside the rocks. Continue your Georgia tour by visiting a local family’s private wine cellar for house wine tasting and homemade lunch. After lunch arrive to Mtskheta, old capital town of ancient Georgia and one of the most important historical cities of the country. Visit the old town and its principal sight – Svetitskhoveli monastery. The name of the monastery means “living pillar” and it is widely believed that the place is a burial site of Jesus Christ’s mantle. Being one of the principal churches in Georgia, the monastery is also one of the most revered places in Caucasus. Drive back to Tbilisi. Separate AWD vehicle in Kazbegi.